Nguyen Dap has turned his fishing job into a successful tourism service on a coastal village, 3km away from the country’s renowned Hoi An City. A trade that he inherited from his father, fishing now provides a major source of income for his family and 7,000 people in Cam An Village on beautiful An Bang Beach. Voted one of the top 100 beaches in the world by CNN Summer Travel last year, the idyllic beach is a favourite among foreign tourists year round. Dap, 65, and his 10-member family, have provided fishing lessons and private sun bathing on the beach over the past two years. His house, just few blocks from the white sand, provides a free fishing service (including net fishing), paddling coracles and cooking services for tourists from 6am until lunch time. “I have experience in the village’s fishing trade. But I’ve created a new job from this traditional craft. It offers real practice and memorable experiences for foreigners visiting the coastal village,” Dap says. “Hoi An is always crowded with tourists year around, but An Bang beach has lured tourists over past decade for being tranquil, clean and safe,” he says. The fisherman adds that An Bang beach is not affected by erosion from the flood season due to its distance away from Cua Dai estuary. Dap reserves a boat on the beach and a net for his fishing service. Although traditional fishermen head out in the very early hours of the morning and return at lunch time, his net fishing service is available at any time during the day for tourists. Your move: Foreign tourists play chess while relaxing on the beach. However, a fishing trip often begins in the morning, in preparation for a full seafood lunch. “We go out to sea with a 200m net on our boat. We cast the net as far as 50m off the coast. A five-member crew will help us draw the net back to the coast after an hour,” the old fisherman explains. 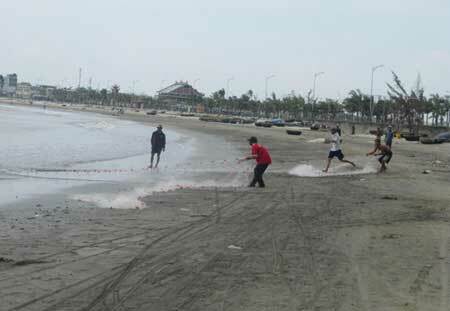 “It’s easy fishing because tourists can join with us to draw in the fishing net. Tourists and the host can also have a bumper batch of seafood,” he says. “We will cook and offer visitors seafood that we catch straight from the sea. Of course, tourists can feel how hard each working day is for fisherman. However, it’s also interesting experience for them in terms of learning new cuisine and learning about the village’s fishing traditions,” he adds. Dap’s family are also an integral part of the beach’s hospitality. In fact, many villagers in An Bang beach, 500m away from his home, have been able to get experience hosting tourists over the past decade. “We try to make visitors feel free and create an exciting experience on the beach. There is no pestering from vendors or upselling goods,” Linh says. “For VND50,000 (US$2.4), we offer a parasol and a deck for all-day sunbathing, but visitors will get it free of charge if they organise to have lunch at my house,” he offers. According to Dap, his home-made restaurant can cook up to 20 dishes for between VND200,000-500,000 ($9.5-$24) per person, offering a full spread of fresh seafood including tuna, mackerel, squid and tiger prawn. “Foreign tourists come at around 10am in the morning as they get up late at their resorts and hotels in Hoi An. Most of them come here by bicycle – the most preferred and environmentally friendly vehicle in Hoi An city,” says Nguyen Thi Ha, Dap’s youngest daughter. Ha has attended a short-course for English training in Hoi An so that she can communicate with foreigners visiting the beach and participate in the family business. “I just left high school, so I’ve returned home to support my family’s tourism service. The beach gets really busy when tourists come here in the warmer months to sunbath and relax on the beach, pretty much from morning until late in the evening,” Ha says. Fishers of men: Fishermen haul in their nets. Nguyen Dap, a local man, has turned his fishing job into a successful tourism service. The 18-year-old is adamant tourists also have the choice of free options to stay on the beach if they are on a tight budget. “They can lay back on deck from lunch through to sunset for only $2.4 and a few dollars for soft drink without any disturbances,” she says with a big smile. “Tourists also take a big interest in cooking with us”, Ha adds. Alan Hadley, a tourist from Australia, is among the many tourists flocking to An Bang beach for its serene and picturesque location. “I visited Ha Noi and HCM City, but the beach in Hoi An was unforgettable. I felt so free reading a book and relaxing on the beach in a world of my own,” Alan says. After renting a room in a resort nearby with a private beach, he opted to spend some quiet time alone on An Bang beach after a quick drive on a motorbike. “I’m very impressed with the soft sand, gentle waves and friendly villagers. They welcomed me with smiles and warm hospitality. The seafood was so fresh and cheap! I definitely want to come back here again soon,” he says. Fisherman Dap says the locals are diligent about keeping the beach clean and removing rubbish. “We try to keep the beach free from rubbish. It’s how we get more tourists coming back to visit the beach. They will feel free and safe when spending time with us,” he assures. Importantly, the tourism service is not just improving the lives of visitors, but those of Dap’s family. Dap said his family can earn up to VND50 million in profits a year from the service. “We can host a night party on the beach for tourists. A barbecue on a pristine beach is certainly one way to mark a great holiday an inspire people to stay here longer,” Dap says. The 4km long beach, which links up with My Khe beach in Da Nang City, provides a romantic setting for couples when visiting Hoi An. 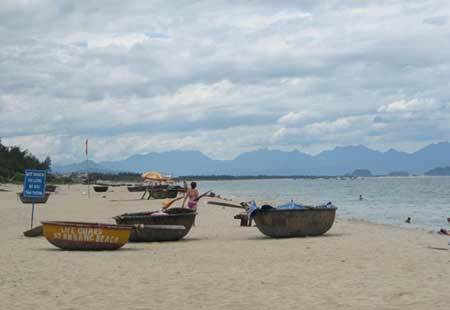 Rose travel agency has now included the fishing village on An Bang beach as part of its official tour programme.